I was at Deseret Industries in Provo. Saw this book. "Gandhi, An Autobiography". I stopped. I searched. Wait! Gandhi wrote a book about himself? His life. 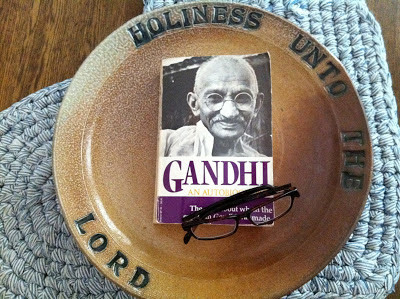 I quote Gandhi. I like him. I think he is awesome. Um, Wait. I know very little about him. Wait. Like really, who is he? I spent $2.00. I started reading on the road trip home. Boy, what a treat. I am getting my money's worth. Love what I have read so far. He is candid and honest. He shares joys and regret. He repents within the pages. Many stories have touched me. I will share a small part of one. He speaks of a time in his youth. He stole. There is a richness in his culture. Hindu. Indian. A connectedness with others. Collectivistic way. Community before the individual. Chapter 8. "I was trembling as I handed the confession to my father. He read it through, and pearl-drops trickled down his cheeks, wetting the paper. For a moment he closed his eyes in thought and then tore up the note. He had sat up to read it. He again lay down. I also cried. I could see my father's agony. Those pearl-drops of love cleansed my heart, and washed my sin away. This sort of sublime forgiveness was not natural to my father. I had thought that he would be angry, say hard things, and strike his forehead. But he was so wonderfully peaceful, and I believe this was due to my clean confession." Clean confession? I think of self awareness. Seeing the truth about ourselves. Knowing the truth. Sharing that with others. Those we love. Growing. Progressing. Reaching. Toward God. Click HERE if you want a pdf of this thoughtfully written book.